If I were stranded on a desert island with my family, destined to homeschool my children there until the next boat arrived, and I could only have one educational resource there with me, I would have to choose my library card. Of course, there would need to be a local library on that island, but that’s beside the point. All joking aside, reading with my children is the one thing I have done almost everyday without fail since their babyhood. Whether we’re learning about the Middle Ages, celebrating a special holiday, or just cuddling up with a bedtime story, good children’s books are at the heart of our family life. I’ll venture to guess that the same holds true for many homeschooling families out there. 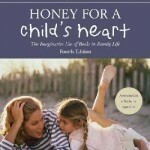 Because of my affinity for good children’s books, one of the first resources I purchased as a new homeschool Mom was Honey for a Child’s Heart: The Imaginative Use of Books in Family Life by Gladys Hunt. This book is a treasure trove of wisdom regarding the use and impact of books on a child’s life, and it contains excellent lists of book recommendations that I find myself referring to over and over again. Honey for A Child’s Heart has helped me in answering this question on many occasions. It has aided me in choosing some of the best and most beloved stories to share with my children. I hope that you might find it a useful tool as well. Written by Shannon, who blogs about her family’s homeschooling and reading adventures at Song of My Heart. Have you met Sir Cumference? I LOVE this book too! It’s such a great resource for any parent, homeschooling or not. Thanks for reviewing it. woops! didn’t get my info right on the last post. sorry! .-= ginny´s last blog ..the BIG 7! =-. Someone I know just recommended this book to me too. Apparently I need to check it out! .-= Angie @ Many Little Blessings´s last blog ..7 Quick Takes: January 8, 2010 (Vol. 26) =-. .-= Richele´s last blog ..Faith on thin or thick ice during a blizzard? =-. Years ago, when my now-13yo dd was a toddler, I was searching the library stacks & usually letting her pick out her own books. It was right after story time, so there were lots of moms & kids in the library. A very sweet lady, a stranger to me, told me about Honey for a Child’s Heart & I bought it as soon as I could (that was the old edition!). Just in case you don’t know, there’s also Honey for a Teen’s Heart (which is now on my wish list) & Honey for a Woman’s Heart (because sometimes we want to read for our own improvement or enjoyment!). Thanks for this review, Shannon!